When you were a child or a teenager, did you enjoy the dodgems and ghost trains and candy floss on the seafront in Bray? But I always had the feeling that my parents did not like me going to Bray in the early 1960s. Perhaps it had more to do with an innate snobbery about those innocent seafront enterprises rather than some actual dislike of the place. I was hardly going to fritter away a future inheritance. Now many of those “amusement centres” have gone from the seafront in Bray, and they have been replaced by bars and cafés. 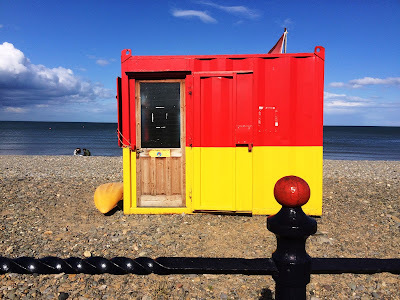 Bray is one of the places I visit frequently for walks on the beach and late lunches, and I also enjoy the architecture of the elegant Victorian and Edwardian houses in the streets behind the seafront. But the memory of those summer days in the early or mid-1960s returned this afternoon during a visit late in the day for lunch and a walk on the beach. I had a ticket for this afternoon’s international cricket match between Ireland and Hong Kong. There is never enough time for cricket in any one summer. But rain was threatening all day, the winds were off, and I decided to call off trying to use public transport for a 1½ -hour journey north to what, eventually, turned out to have been a disappointing game. Instead, while the rain was still coming down, two of us drove south to Bray, through the long snarls of Friday afternoon traffic that always indicates an exodus from Dublin in the home of summer sunshine on the Wexford coast. 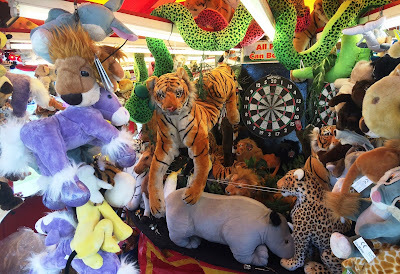 And those 1960s memories returned because the seafront on Bray was packed with funfairs and families as Bray begins a weekend of entertainment and, as it seems, many Muslim families were celebrating Eid and the end of Ramadan. How Ireland has been transformed beautifully over the course of half a century. But the rain was still coming and going in snatches and patches. And instead of walking along the seafront we first had a late lunch in Carpe Diem which has become one of my favourite Italian restaurants in Ireland, and an imaginative place to explore Italian wines. Lunch was accompanied by a glass of Vermentino. This is made from a light-skinned wine grape that is planted in Sardinia, in Liguria under the name Pigato, to some extent in Corsica, in Piedmont under the name Favorita, and in increasing amounts in Languedoc-Roussillon. But I think this afternoon’s glass was from Sardinia. 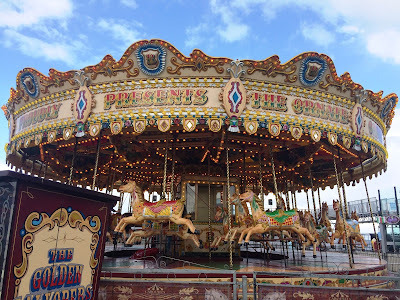 It was followed by double espressos, and when we ventured back out onto the seafront the sun was shining, the sky and the sea were blue … and the funfairs on the promenade were still full of life. We walked along the promenade for a while, enjoying the sight as stalls were going through the last stages of being set up for Bray Summer Fest this weekend, including the Food and Craft Market tomorrow and Sunday, and the Bray Air Display on Sunday afternoon. 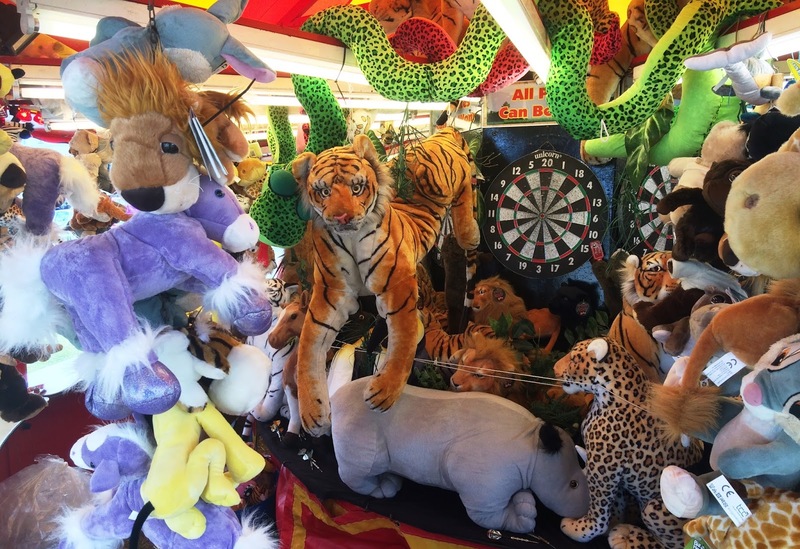 The funfair continues until 3 August. Fluttering high was a collection of flags from EU member states. Greece and Germany were separated by just one tricolour. What could bring them together? For the past week or more, I have been suggesting small but emotionally significant ways of showing solidarity with Greek people during this crisis. In my final posting on this theme this morning, I want to suggest listening to some Greek composers or some Greek music. In recent weeks, flashmobs have been appearing on Facebook postings, dancing the ‘Zorba dance’ or συρτάκι (syrtáki) as a protest in solidarity with Greece. When many tourists return from package holidays in Greece, this is often the only Greek music they remember, and they react positively towards Greece when hear it again and again in Greek restaurants at home. The music was composed by Mikis Theodorakis and the dance sequence comes in Zorba the Greek when the movie ends with the spine-tingling “teach me to dance” sequence. Zorba and Basil are alone together on the beach in Crete, realising that although life’s dance can be learned along many different paths, sometimes the destination is the same, no matter which route is chosen. And they dance syrtáki together on the beach. But the movements were contrived on location by Anthony Quinn. Superstitious actors wish each other well on stage with the greeting, “Break a leg.” Quinn had actually broken a bone in his foot on location, yet remained determined to continue filming. He improvised unexpectedly by mixing the slow and fast versions of χασάπικο (hasapiko), a Greek folk dance from Constantinople dating back to the Middle Ages. When he was asked by the production team what he was dancing, he replied: “Syrtáki.” His reply played on a Greek word for dragging, for Quinn should have been hopping when he was dragging his leg. No-one imagined that half a century on, syrtáki would be a popular Greek dance, and that it would be danced around the world in solidarity with the suffering people of Greece. Syrtáki is danced in a line or circle, with dancers holding their hands on the neighbours’ shoulders. The dance begins with slower, smoother actions, gradually transforming into faster, vivid ones, often including hops and leaps. The Guinness World Record was set in 2012 when 5,614 people danced syrtáki for five minutes in Volos. 1, The composer and songwriter Mikis Theodorakis (Μίκης Θεοδωράκης) has written the score for films such as Zorba the Greek (1964), Z (1969) and Serpico (1973), and is probably Greece’s best-known living composer. He was a key voice against the colonels, who jailed him. Theodorakis was born in Chios I 1925, and studied music in Athens and Paris. Until the late 1980s, he was identified with the political Left, but in 1989 he ran as an independent candidate within the centre-right New Democracy party and in 1990 he was became a cabinet minister under Constantine Mitsotakis. He continues to speak out on many causes, including Greek-Turkish-Cypriot relations, and against the War in Iraq. He has taken part in protests with the Syriza MEP Manolis Glezos, and in an interview with Frankfurter Allgemeine Zeitung last month, he called on the Prime Minister Alexis Tsipras to not follow the way of his predecessors and sign a bad agreement with creditors. His most significant and influential works are based on Greek poetry: Epiphania (Giorgos Seferis), Little Kyklades (Odysseas Elytis), Axion Esti (Odysseas Elytis) and Romiosini (Yannis Ritsos). Many of these works were first performed at concerts with one of the greatest Greek voices, Maria Farantouri. The Ballad of Mauthausen was inspired by Mauthausen – Thirty Years Ago, the memoirs of Iacovos Kambanellis, and both the book and the music were published simultaneously in 1965. Kambanellis was a survivor of Mauthausen, the Nazi concentration camp in Austria, where 240,000 Jews and political “undesirables” were murdered. He was a close friend of Theodorakis, and his publisher suggested that they publish the two works together. But the music also serves as a critique of debased Greek political and cultural life in the mid-1960s. The first performance of Mauthausen stirred such controversy that all music by Theodorakis was banned from Greek state radio only two days after the first performance. Within two years, the colonels had seized power and silenced Theodorakis for seven years. In the week that Oskar Groening (94), known as “the Bookkeeper of Auschwitz,” was convicted in Germany in what could be one of the last big Holocaust trials and jailed for his part in the murder of 300,000 people, it was disturbing to listen Maria Farantouri singing this oratorio by Theodorakis once again. Although he now uses a wheelchair, the music of Theodorakis remains a potent element in Greek politics and culture. Q I am a big fan of Vangelis. Can I still listen to my ‘Chariots of Fire’ CD? A No. All Vangelis soundtracks are now outside the official EU preferred easy listening playlists. You may had in your CDs at your local HMV where they will be exchanged for ‘Conchita Wurst sings Serge Gainsbourg’ or a box set of German oompah music. Vangellis expanded this work with three more tracks on El Greco in 1998. In 2007, he composed the soundtrack for the movie El Greco, released on CD as El Greco Original Motion Picture Soundtrack in Greece in 2007. 3, I once interviewed the Greek-Irish composer Ross Daly for The Irish Times, and met him in Dublin in 2005 during his concert in the National Concert Hall. He was born in King’s Lynn to Irish parents, and he has lived near Iraklion in Crete for over 35 years. He specialises in the Cretan lyra, and uses instruments from throughout the Eastern Mediterranean, the idle East and South Asia. He once said: “Music is the language of my dialogue with that which I perceive to be sacred.” In 2004, he was the artistic director of the cultural programme of the Olympic Games for the Olympic city of Iraklion. He stood in the European Elections in 2009, and has been outspoken in recent months about the economic and political crisis in Greece. After a long pause from recording, Ross Daly self-released a new album The other side (August 2014). This album was recorded with some of his closest collaborators from the previous 10 years, and features nine original compositions influenced by a large range of musical traditions from Turkish classical and folk to Cretan, North Indian, Persian, Azeri and Balkan. This new CD is currently available here and here also. 4, Manos Hatzidakis (Μάνος Χατζιδάκις) (1925-1994) was born in Xanthi, the son of a lawyer from Rethymnon in Crete, and took an active part in the restiance movement during the Nazi German occupation of Greece. In the English-speaking world, he is best-known for his Academy-award winning title song for the movie Never on Sunday. But, along with Theodorakis, he was one of the prime movers of the Éntekhno song, and he introduced rembetiko or working class folk music to the Greek middle classes. Other great Greek composers whose work is worth exploring and becoming familiar with include Michalis Koumbios, Manos Loizos, Michalis Terzis, Giorgos Stavrianos and Yannis Markopoulos, who wrote the soundtrack of the 1970s BBC television series Who Pays the Ferryman and what was a hit in 1978. A good introduction to Greek folk music is Road to Rembetika: Music of a Greek sub-culture, songs of love, sorrow and hashish, by Gail Host, first published in 1975, and republished as recently as last year . The rembetika, songs were sung in the poor quarters of Smyrna, Istanbul and the ports of Greece in the late 19th century, became the popular bouzouki music from the 1930s on. The rembetika were the music of outsiders, who developed their own slang and their own forms of expression. Road to Rembetika was the first book in English to offer a general survey of the world of the rembetes who smoked hashish and danced the passionate introspective Ζεϊμπέκικο ( zeimbekiko ) to release their emotions. Gail Holst is an Australian musician and writer who first came to Greece 50 years ago in 1965 and she has continued to perform and write about Greek music ever since. This book is now a classic portrayal of this uniquely Greek musical genre, and has inspired a BBC documentary. Zeimbekiko is now one of the most popular dances and rhythms in Greece. It is considered an urban improvisational dance, following a dancing pattern of 9/8. Its origins date back to a warriors’ dance in Anatolia called zeybek. It was once known only to the islanders, especially those living near Asia Minor but was introduced to the Greek mainland with the 1922 genocide in Asia Minor and the influx refugees into Greece. One of the most important rembetiko composers, Markos Vamvakaris from Syros, was one of the pioneering figures in importing, shaping and naturalising zeimbekiko dance. Some of the best-known zeimbekiko composers more recently include Vassilis Tsitsanis, Apostolos Kaldaras, Stavros Xarhakos and Manos Loizos. This dance is passionate and flamboyant. It is a personal dance, a way to express individuality, but also fears and desires, a way to unwind through music and dance. Usually only one person at a time may dance it and everyone else has to kneel down, forming a circle around the dancer, clapping and following the rhythm and encouraging the dancer. It is an introverted dance that reflects the sorrow, anguish and pain of the dancer as well as his emotional distress and his losses. There are myriad reasons today in Greece to reflect sorrow, anguish and pain in this dance of emotional distress and loss. 7, Yesterday, I suggested reading some books by Greek writers or about Greece.